KUALA LUMPUR: Prices of condominiums in the Kuala Lumpur city centre are expected to remain volatile even after the Malaysian property market recovers from the effects of the global economic downturn, expected in two years, according to property consultant Rahim & Co.
“The fundamental thing is there is definitely an oversupply situation. Whether the economy is strong or whether it continues to grow at a healthy rate, there is the fundamental issue of oversupply. With this situation, I don’t see prices even stabilising or picking up in the near future, especially for luxury condominiums,” Savills Rahim & Co managing director Robert Ang said. Savills Rahim & Co is the international arm of Rahim & Co. He said 1,200 units of luxury condos had been completed in the last two years, while at least another 1,000 units are expected to be completed in the next two years. “We see these apartments as not very well occupied, so obviously there’s a bit of strain on investors, in terms of rental yields and returns,” he said. He added, however, the current compressed yields of between 4% and 5% for the condos were expected to pick up to 2006 levels of 6% to 7%, as the property market weakened further. Rahim & Co sees the supply overhang of condos in the KLCC vicinity at between 25% and 30%, while the valuations of such properties could fall between 15% and 20% this month, with a further decline expected in the next three months, its founder and executive chairman, Datuk Abdul Rahim Rahman said. Properties in the area currently command an average price of between RM1,200 and RM1,600 per square foot (psf), he said. 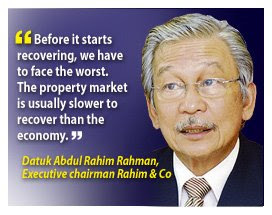 Abdul Rahim said, however, the country’s property market, which had yet to feel the brunt of the economic downturn, could recover within two years, although this would depend on the effects of the government’s planned second economic stimulus package. “Before it starts recovering, we have to face the worst. We are expecting the economy to recover in 12 to 16 months. The real estate market usually recovers slower than the economy, so it could recover within two years,” he said. He said the current steep prices of homes in the KLCC area, weakening demand from foreign buyers hit by the global economic downturn, and cautious lending by banks here had led to the softening of demand for these properties. “How much more the valuations will decline, we do not know. We will have to wait and see within the next two to three months,” he said. Rahim & Co held a media briefing here yesterday on the outlook for the Malaysian property market. The company, whose consultancy services include valuation, real estate agency and research, will also organise a seminar here entitled “Looking Beyond: Challenges and Opportunities in the Malaysian Property Market” in March. Abdul Rahim said office space rentals in the city centre remained stable, with the current rate of RM8 psf expected to remain. But for areas outside the central business district, which will see between eight million and 10 million sq ft of office space expected to come on stream by 2011, rental values could then plunge by as much as 15%. On the outlook for landed residential properties, he said while demand had tapered off, prices remained largely intact. Meanwhile, Ang said the company had advised its clients to defer new residential property launches until the middle of the year, or as late as the third quarter. “We at Rahim & Co have advised two of our clients planning high-end projects to defer their launches, scheduled for December 2008 and early this year. Especially for high-end projects, the demand is very, very weak at the moment,” he said. He said the company also advised its clients to downsize apartment units or use lower-cost fittings to make prices more attractive to buyers, adding that buyers were now looking for lower-priced condos for own occupancy, with investment purchases put on hold. DUBAI: Investors and home buyers in the United Arab Emirates (UAE) may default on payments for properties that have yet to be completed, creating a liability for developers of as much as US$25 billion (US$1 = RM3.63) over the next two years, UBS AG said. "We believe delinquencies on payment terms will be a growing concern over the next few years," Dubai-based UBS real estate and construction analyst Saud Masud said in an interview. "In our view, investors are and will continue to default as per individual risk profile," Saud Masud said. Dubai property prices have dropped 25 per cent from their September peak as banks reduced lending and speculators left the market because of the global financial crisis, Morgan Stanley said. Dubai opened its property market to foreign investors in 2002, and Abu Dhabi followed three years later, fuelling a boom that was boosted by low interest rates. "Our assessment of leverage in Dubai's residential property market is based on the cost to developers to finish properties should investors default on the upcoming supply of 140,000 units," Saud Masud said in a Sunday interview. "We estimate this liability to be roughly US$20 billion to US$25 billion over the next two years," he added. PETALING JAYA: AmFirst Real Estate Investment Trust said net income for its third quarter ended Dec 31 rose 12.3% to RM9.04mil from RM8.05mil in the previous corresponding period, lifted by higher rental rates at its properties. Revenue was RM23.5mil versus RM15.2mil previously. “AmFirst achieved another strong set of results for both the third quarter and the nine-month period, with our properties continuing to demonstrate the ability to attract and retain high-quality tenants,” Am ARA REIT Managers Sdn Bhd chief executive officer Lim Yoon Peng said in a statement yesterday. Am ARA is the the trust manager. “We have lined up enhancement and repositioning works for our properties and they will commence within the first quarter of this year,” he said. On the acquisition front, AmFirst announced last month that it would acquire an additional three-floor space at Menara Summit in Subang Jaya. This brings the fund’s total ownership at Menara Summit to 12 office floor space out of the 13 floors available. AmFirst owns the hotel block and car parks there. The fund currently has six properties under its portfolio worth RM840mil. Nine months’ net profit was RM27.35mil, or 6.38 sen per unit, compared with RM23.56mil, or 5.5 sen per unit, in the previous corresponding period. KUALA LUMPUR: The property sector in the country is likely to weaken further amid worsening economic conditions with the market expected to rebound in two years, said property consultanty firm Rahim & Co Chartered Surveyors. “This all will depend on the Government’s strategy and initiatives to strengthen the economy. “We are not as bad as in 1997 when the property market needed 4-5 years to recover. “We believe this time around, the property market would be stable again within two years after economic recovery,” he said. “Banks are still providing loans to buyers and developers. Apart from that, sellers are getting more flexible on pricing their properties. The latest cut in interest rates by banks will encourage more homeowners to refinance their loans, a trend that should become visible in the market in the next three to six months. Rahim & Co executive chairman Datuk Abdul Rahim Rahman expects the property market in the country to feel the full impact of the global financial crisis in the coming months and to recover in two years. "Before it starts recovering, we have to face the worst. The property market is usually slower to recover than the economy," he told reporters in Kuala Lumpur yesterday. Property prices have dropped by between 10 per cent and 15 per cent since late last year as prospective buyers adopt a wait-and-see attitude in committing towards purchases and banks become more cautious in extending loans. "The situation today is definitely not as bad as during the 1997 Asian financial crisis when it took at least five years for the property market to recover," Abdul Rahim said. He attributed this to the country's more sound economic situation and the RM7 billion economic stimulus package. "In some ways, the decline in the property market helps to stabilise rental rates for some developments, such as the luxury condominium units located in the Kuala Lumpur City Centre (KLCC) vicinity." Abdul Rahim said the average price of luxury condominiums rose as high as RM2,500 per sq ft last year, but has since fallen to between RM1,000 and RM1,500 per sq ft.
"Demand in the KLCC area is not as strong as before. As a result, sellers are now becoming more flexible and willing to negotiate." Asked whether KLCC property prices would return to previous levels once demand picked up, Abdul Rahim said it would depend on several factors. "When the price fetched as high as it did last year, prices of oil and raw material were escalating. But as land area in KLCC is scarce, its property prices won't go down as much." Savills Rahim & Co managing director Robert Ang pointed out that office space in KLCC were going for some RM8 per sq ft, indicating that the segment remained stable. However, he expressed some concern over supply and demand for office space in the area come 2011 when another 8 million sq ft to 10 million sq ft of office space is available in the market. "Although office rental rates are stable right now, the oversupply situation in two years will push rentals down by about 10-15 per cent," he said. TUNE Hotels.com is on track to open at least five hotels, including two in Bali, Indonesia by this year. Chief executive officer Mark Lankester said the hotels in Kuching, Penang and the Low-Cost Carrier Terminal (LCCT) would be opened by the first quarter of this year. "The Tune Hotels.com-Waterfront Kuching will be opened on March 2, while Tune Hotels.com – Downtown Penang and KLIA-LCCT Airport will be in April. "The hotels in Bali are still under construction and are expected to be opened in November," he told a media briefing prior to the launch of its Kuching hotel by state Urban Development and Tourism Minister Datuk Michael Manyin today. Lankester said the company planned to open hotels in Kuantan, Kuala Lumpur, Johor Baru and Batam in Indonesia. "We will continue to draw up (more hotels). In Kuching, we are looking for another site to accommodate more travellers. Tune Hotels.com- Waterfront Kuching, the first franchised hotel, is managed by Limar Management Services Sdn Bhd. In conjunction with opening of the hotel, Tune Hotels.com has teamed up with low-cost airline, AirAsia, to launch a "Tune Me Up Holidays!" promotion to offer a 3-day 2-night return flight plus hotel packages to Kuching from as low as RM56 per person.